It has always been a pleasure for me to help businesses execute a successful modernization strategy. Hence, when I was asked to be part of Fresche Legacy’s IBM i modernization webinar series, I jumped at the chance. The webinar series kicked off last Tuesday and the first part was a huge success. My colleague Nick Hampson and I got the modernization ball rolling nicely in the first part of the Webinar, giving you a look at modernization planning and start-up. I’d like to thank everyone who attended and hope you all learned something of value. 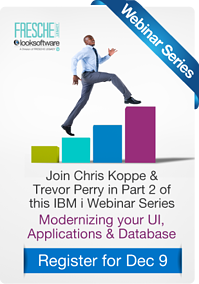 Next, Trevor Perry and I are going to take you on the journey itself, discussing techniques for IBM i database, application and user interface modernization. It’ll be a Fresche look at Modernizing your UI, Applications and Database. Identify and extract complex business rules. Take advantage of simple and easy automated GUI enablement of existing RPG applications. I’m very much looking forward to the presentation. It’s on Tuesday, December 9, and if you haven’t already registered, you can do so here.